There are 231 Assisted Living Facilities in the Miami area, with 170 in Miami and 61 nearby. The average cost of assisted living in Miami is $1,916 per month. This is lower than the national median of $3,346. To help you with your search, browse the 208 reviews below for assisted living facilities in Miami. On average, consumers rate assisted living in Miami 4.2 out of 5 stars. Better rated regions include Miami Gardens with an average rating of 4.6 out of 5 stars. Caring.com has helped 6 families in Miami find high-quality senior care. To speak with one of our Family Advisors about assisted living options and costs in Miami, call (855) 863-8283. Estela Homes For The Elderly Inc.
Amor De Jesus II Corp.
Alf Sevilla Home Care Corp.
J H Puig Investments Inc.
Our Lady Of Fatima Inc.
Reyes Senior Care Of Miami Inc.
Spring Of Life Alf Inc.
Sunset Senior Care Of Miami Inc. Promotion ends in 66 days! Sweet Hope Research Specialty, Inc.
Live Well Home Alf Inc.
Buena Vista Health Care II, Corp.
Review of Douglas Gardens Hospice, Inc.
A thriving coastal metropolis with world-class beaches and cultural offerings, Miami is home to more than 463,000 residents, while millions more reside in the city's expansive suburbs. Just under 17 percent of the city's population is 65 years or older. For residents in that age group who require assisted living care, Miami has 170 assisted living facilities. In Miami, as in all of Florida, assisted living facilities (ALFs) are licensed and regulated by the Bureau of Health Facility Regulation. Residents aged 65 and over are eligible for free transportation on Miami-Dade Transit with a Golden Passport EASY Card. Dozens of other transportation options that offer discounts for seniors can be found on Find a Ride Florida and can be paid by Medicaid for approved uses, such as doctor and hospital visits. Miami has a cost of living about 23 percent higher than the national average, although this is mostly due to housing prices. Healthcare, which is often a major expense for seniors, is 1 percent cheaper than average in Miami, while the cost of other staple purchases, such as groceries and utilities, are around average. Miami has an ideal climate for seniors who want to get away from the cold and don't mind a bit of heat, humidity and summer rain to do so. The average July high is close to 90 degrees, but in January, when most of the country is freezing, Miami usually stays above 60. The city gets 61 inches of rain per year, compared to the national average of 39 inches. Miami's violent and property crime rates of 48.8 and 62.7 out of 100 both exceed the national averages of 22.7 and 35.4. That said, assisted living facilities tend to be very safe, and most offer an abundance of security features. The air quality in Miami is slightly worse than the national average, but the difference is not large enough to present much of a concern, even to seniors with asthma or breathing difficulties. The Miami area is home to world-class medical facilities, including the University of Miami Health System, in the event of medical emergencies or illness. Assisted Living costs in Miami start around $1,916 per month on average, while the nationwide average cost of assisted living is $4,000 per month, according to the latest figures from Genworth’s Cost of Care Survey. It’s important to note that assisted living rates in Miami and the surrounding suburbs can vary widely based on factors such as location, the level of care needed, apartment size and the types of amenities offered at each community. 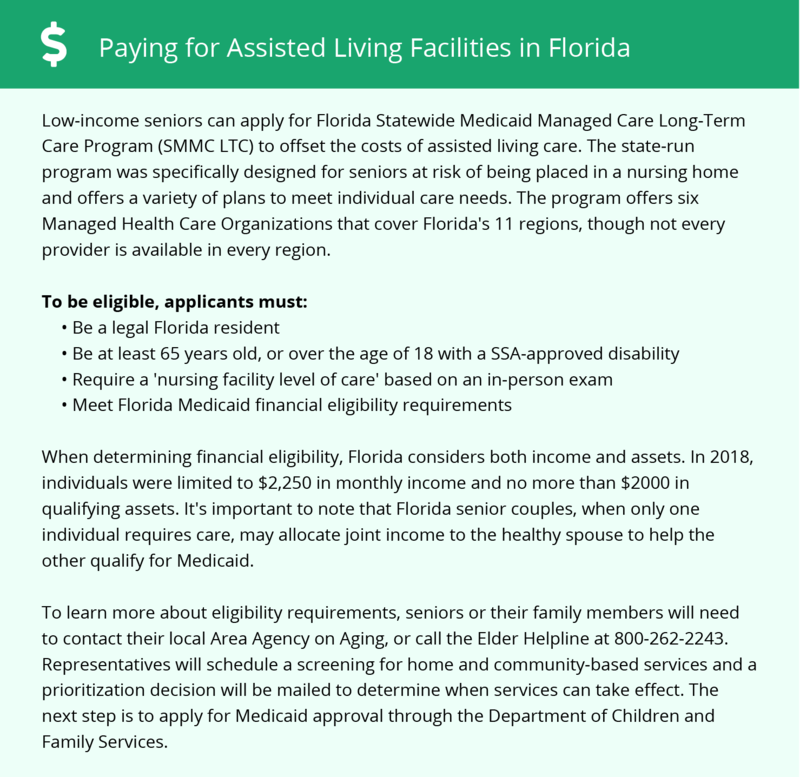 Floridians aged 65 and over who are eligible for Medicaid can receive financial help through the Statewide Medicaid Managed Care Long-Term Care Program (SMMC LTC). This program replaces all Medicaid HCBS Waivers that were in place before being discontinued in 2014. All applicants must be screened through the Comprehensive Assessment and Review for Long-Term Care Services (CARES), whether they intend to enter a nursing home or assisted living. Miami and the surrounding area are home to numerous government agencies and non-profit organizations offering help for seniors searching for or currently residing in an assisted living community. These organizations can also provide assistance in a number of other eldercare services such as geriatric care management, elder law advice, estate planning, finding home care and health and wellness programs. To see a list of free assisted living resources in Miami, please visit our Assisted Living in Florida page. Miami-area assisted living communities must adhere to the comprehensive set of state laws and regulations that all assisted living communities in Florida are required to follow. Visit our Assisted Living in Florida page for more information about these laws.